A South African man convicted of murdering a man whose remains were found in a lion enclosure has been sentenced to life in prison. 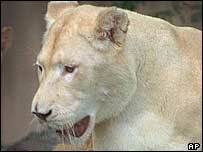 White farmer Mark Scott-Crossley and an employee beat up black former worker Nelson Chisale, and threw him to lions. Scott-Crossley had earlier sacked Mr Chisale, who was murdered when he went back to the farm to get his belongings. The case has highlighted race tensions that still exist in the South African countryside 11 years after apartheid. Court proceedings on Friday were delayed while Scott-Crossley was married to Sim Strydom, whom he reportedly first met when she visited him in jail. Crowds outside the court in the town of Phalaborwa celebrated when the sentence was announced. "Let him rot in jail," someone shouted as they left the courtroom, reports the South African Press Agency, Sapa. Judge George Maluleke said he was satisfied that Scott-Crossley deserved the strongest punishment he was allowed to impose, which was reserved for "monstrous" crimes. "No crime fits this description more than the one before me and there is no doubt it would warrant this extreme punishment," the judge said. 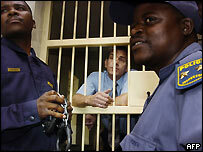 Scott-Crossley's accomplice, Simon Mathebula, was sentenced to 15 years in prison, with three years suspended. "We did expect a heavy sentence," Scott-Crossley told journalists. "We are sorry that the family didn't accept our offer of financial compensation. It was not an effort to try and bribe them, but we really feel sorry for them and we are going to fight the sentence," he said. Mr Chisale's niece Fetsang Jafta said: "I'm satisfied with the outcome." Mr Chisale was sacked late in 2003. In January 2004, he returned to pick up his belongings at the farm near the Kruger National Park in the north-east of the country. There he was beaten up by Scott-Crossley and Mathebula, his employee. They tied him up and then took him to a nearby lion breeding centre, where they threw him into an enclosure. The court was unable to establish whether Mr Chisale was already dead when he was thrown into the enclosure, as Scott-Crossley claimed during his defence. The only remains recovered were a few bones and some shredded clothing. The death penalty was abolished in South Africa in 1996, and life imprisonment is the maximum sentence for murder.